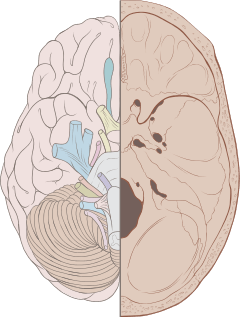 The terminal nerves, olfactory nerves (I) and optic nerves (II) emerge from the cerebrum or forebrain, and the remaining ten pairs arise from the brainstem, which is the lower part of the brain. 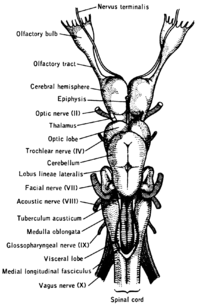 Cranial nerves are generally named according to their structure or function. For example, the olfactory nerve (I) supplies smell, and the facial nerve (VII) supplies motor innervation to the face. Because Latin was the lingua franca (common language) of the study of Anatomy when the nerves were first documented, recorded, and discussed, many nerves maintain Latin or Greek names, including the trochlear nerve (IV), named according to its structure, as it supplies a muscle that attaches to a pulley (Greek: trochlea). 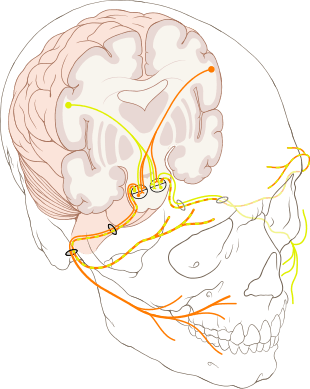 The trigeminal nerve (V) is named in accordance with its three components (Latin: tri-geminus meaning triplets), and the vagus nerve (X) is named for its wandering course (Latin: vagus). Cranial nerves are numbered based on their rostral-caudal (front-back) position, when viewing the brain. If the brain is carefully removed from the skull the nerves are typically visible in their numeric order. Cranial nerves have paths within and outside of the skull. The paths within the skull are called "intracranial" and the paths outside the skull are called "extracranial". There are many holes in the skull called "foramina" by which the nerves can exit the skull. All cranial nerves are paired, which means that they occur on both the right and left sides of the body. The muscle, skin, or additional function supplied by a nerve on the same side of the body as the side it originates from, is referred to an ipsilateral function. If the function is on the opposite side to the origin of the nerve, this is known as a contralateral function. Some of the cranial nerves have sensory or parasympathetic ganglia (collections of cell bodies) of neurons, which are located outside of the brain (but can be inside or outside of the skull). After emerging from the brain, the cranial nerves travel within the skull, and some must leave this bony compartment in order to reach their destinations. Often the nerves pass through holes in the skull, called foramina, as they travel to their destinations. Other nerves pass through bony canals, longer pathways enclosed by bone. These foramina and canals may contain more than one cranial nerve, and may also contain blood vessels. 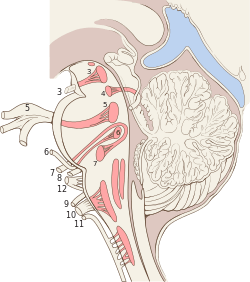 The olfactory nerve (I), actually composed of many small separate nerve fibers, passes through perforations in the cribiform plate part of the ethmoid bone. These fibers terminate in the upper part of the nasal cavity and function to convey impulses containing information about odors to the brain. The facial nerve (VII) and vestibulocochlear nerve (VIII) both enter the internal auditory canal in the temporal bone. The facial nerve then reaches the side of the face by using the stylomastoid foramen, also in the temporal bone. Its fibers then spread out to reach and control all of the muscles of facial expression. The vestibulocochlear nerve reaches the organs that control balance and hearing in the temporal bone, and therefore does not reach the external surface of the skull. The glossopharyngeal (IX), vagus (X) and accessory nerve (XI) all leave the skull via the jugular foramen to enter the neck. The glossopharyngeal nerve provides innervation to the upper throat and the back of the tongue, the vagus provides innervation to the muscles in the voicebox, and continues downward to supply parasympathetic innervation to the chest and abdomen. The accessory nerve controls two muscles in the neck and shoulder. The vagus nerve (X) provides sensory and autonomic (parasympatheic) motor innervation to structures in the neck and also to most of the organs in the chest and abdomen. The trigeminal nerve (V) is composed of three distinct parts: The Ophthalmic (V1), the Maxillary (V2), and the Mandibular (V3) nerves. Combined, these nerves provide sensation to the skin of the face and also controls the muscles of mastication (chewing). Conditions affecting the trigeminal nerve (V) include trigeminal neuralgia, cluster headache, and trigeminal zoster. Trigeminal neuralgia occurs later in life, from middle age onwards, most often after age 60, and is a condition typically associated with very strong pain distributed over the area innervated by the maxillary or mandibular nerve divisions of the trigeminal nerve (V2 and V3). 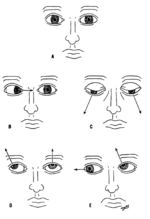 Lesions of the facial nerve (VII) may manifest as facial palsy. This is where a person is unable to move the muscles on one or both sides of their face. A very common and generally temporarly facial palsy is known as Bell's palsy. Bell's Palsy is the result of an idiopathic (unknown), unilateral lower motor neuron lesion of the facial nerve and is characterized by an inability to move the ipsilateral muscles of facial expression, including elevation of the eyebrow and furrowing of the forehead. 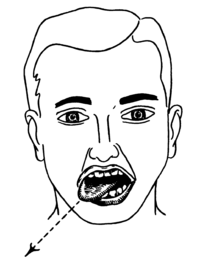 Patients with Bell's palsy often have a drooping mouth on the affected side and often have trouble chewing because the buccinator muscle is affected. Loss of function of the vagus nerve (X) will lead to a loss of parasympathetic innervation to a very large number of structures. Major effects of damage to the vagus nerve may include a rise in blood pressure and heart rate. Isolated dysfunction of only the vagus nerve is rare, but can be diagnosed by a hoarse voice, due to dysfunction of one of its branches, the recurrent laryngeal nerve. Damage to the accessory nerve (XI) will lead to ipsilateral weakness in the trapezius muscle. This can be tested by asking the subject to raise their shoulders or shrug, upon which the shoulder blade ( scapula) will protrude into a winged position. Additionally, if the nerve is damaged, weakness or an inability to elevate the scapula may be present because the levator scapulae muscle is now solely able to provide this function. Depending on the location of the lesion there may also be weakness present in the sternocleidomastoid muscle, which acts to turn the head so that the face points to the opposite side. 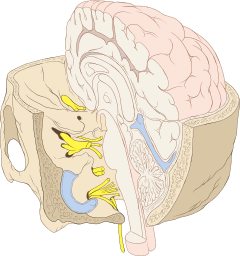 The hypoglossal nerve (XII) is unique in that it is innervated from both the motor cortex of both hemispheres of the brain. Damage to the nerve at lower motor neuron level may lead to fasciculations or atrophy of the muscles of the tongue. The fasciculations of the tongue are sometimes said to look like a "bag of worms". Upper motor neuron damage will not lead to atrophy or fasciculations, but only weakness of the innervated muscles. Nerves may be compressed because of increased intercranial pressure, a mass effect of an intracerebral haemorrhage, or tumour that presses against the nerves and interferes with the transmission of impulses along the nerve. A loss of functionality of a single cranial nerve may sometimes be the first symptom of an intracranial or skull base cancer. 1 2 3 4 5 6 7 8 9 10 11 12 13 14 15 16 17 18 19 20 21 22 23 24 25 Vilensky, Joel; Robertson, Wendy; Suarez-Quian, Carlos (2015). 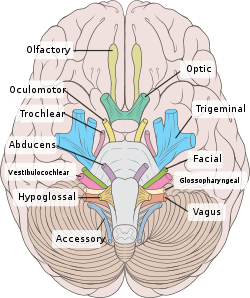 The Clinical Anatomy of the Cranial Nerves: The Nerves of "On Olympus Towering Top". Ames, Iowa: Wiley-Blackwell. ISBN 978-1-118-49201-7. 1 2 3 4 5 6 Kandel, Eric R. (2013). Principles of neural science (5 ed.). Appleton and Lange: McGraw Hill. pp. 1019–1036. ISBN 978-0-07-139011-8. ↑ Harper, Douglas. "Trigeminal Nerve". Online Etymology Dictionary. Retrieved 2 May 2014. ↑ Davis, Matthew C.; Griessenauer, Christoph J.; Bosmia, Anand N.; Tubbs, R. Shane; Shoja, Mohammadali M. "The naming of the cranial nerves: A historical review". Clinical Anatomy. 27 (1): 14–19. doi:10.1002/ca.22345. 1 2 Mallatt, Elaine N. Marieb, Patricia Brady Wilhelm, Jon (2012). Human anatomy (6th ed. media update. ed.). Boston: Benjamin Cummings. pp. 431–432. ISBN 978-0-321-75327-4. ↑ Albert, Daniel (2012). Dorland's Illustrated Medical Dictionary. (32nd ed.). Philadelphia, PA: Saunders/Elsevier. ISBN 978-1-4160-6257-8. 1 2 Drake, Richard L.; Vogl, Wayne; Tibbitts, Adam W.M. Mitchell; illustrations by Richard; Richardson, Paul (2005). Gray's anatomy for students. Philadelphia: Elsevier/Churchill Livingstone. pp. 800–807. ISBN 978-0-8089-2306-0. 1 2 Mtui, M.J. Turlough FitzGerald, Gregory Gruener, Estomih (2012). Clinical neuroanatomy and neuroscience (6th ed.). [Edinburgh? ]: Saunders/Elsevier. p. 198. ISBN 978-0-7020-3738-2. 1 2 3 4 5 6 7 8 9 10 11 12 13 Kandel, Eric R. (2013). Principles of neural science (5. ed.). Appleton and Lange: McGraw Hill. pp. 1533–1549. ISBN 978-0-07-139011-8. ↑ Nesbitt AD, Goadsby PJ (Apr 11, 2012). "Cluster headache". BMJ (Clinical research ed.) (Review). 344: e2407. doi:10.1136/bmj.e2407. PMID 22496300. 1 2 Fitzgerald, M.J. Turlough FitzGerald, Gregory Gruener, Estomih Mtui (2012). Clinical neuroanatomy and neuroscience (6th ed.). [Edinburgh? ]: Saunders/Elsevier. p. 235. ISBN 978-0-7020-3738-2. ↑ Mtui, M.J. Turlough FitzGerald, Gregory Gruener, Estomih (2012). Clinical neuroanatomy and neuroscience (6th ed.). [Edinburgh? ]: Saunders/Elsevier. pp. 220–222. ISBN 978-0-7020-3738-2. ↑ Bickley, Lynn S., Peter G. Szilagyi, and Barbara Bates. Bates' Guide to Physical Examination and History-taking. Philadelphia: Wolters Kluwer Health/Lippincott Williams & Wilkins, 2013. Print. ↑ Mukherjee, Sudipta; Gowshami, Chandra; Salam, Abdus; Kuddus, Ruhul; Farazi, Mohshin; Baksh, Jahid (2014-01-01). "A case with unilateral hypoglossal nerve injury in branchial cyst surgery". Journal of Brachial Plexus and Peripheral Nerve Injury. 07 (01). doi:10.1186/1749-7221-7-2. PMC 3395866 . PMID 22296879. 1 2 O'Connor, Nicholas J. Talley, Simon (2009). Clinical examination : a systematic guide to physical diagnosis (6th ed.). Chatswood, N.S.W. : Elsevier Australia. pp. 330–352. ISBN 978-0-7295-3905-0. 1 2 3 4 Britton, the editors Nicki R. Colledge, Brian R. Walker, Stuart H. Ralston ; illustrated by Robert (2010). Davidson's principles and practice of medicine. (21st ed.). Edinburgh: Churchill Livingstone/Elsevier. pp. 787, 1215–1217. ISBN 978-0-7020-3085-7. ↑ Kumar (), Vinay; et al. (2010). Robbins and Cotran pathologic basis of disease (8th ed.). Philadelphia, PA: Saunders/Elsevier. p. 1266. ISBN 978-1-4160-3121-5. ↑ Britton, the editors Nicki R. Colledge, Brian R. Walker, Stuart H. Ralston ; illustrated by Robert (2010). Davidson's principles and practice of medicine (21st ed.). Edinburgh: Churchill Livingstone/Elsevier. p. 1166. ISBN 978-0-7020-3085-7. 1 2 3 Fauci, Anthony S.; Harrison, T. R., eds. (2008). Harrison's principles of internal medicine (17th ed.). New York: McGraw-Hill Medical. pp. 2583–2587. ISBN 978-0-07-147693-5. 1 2 Britton, the editors Nicki R. Colledge, Brian R. Walker, Stuart H. Ralston ; illustated by Robert (2010). Davidson's principles and practice of medicine (21st ed.). Edinburgh: Churchill Livingstone/Elsevier. pp. 1164–1170, 1192–1193. ISBN 978-0-7020-3085-7. ↑ Quiring, Daniel Paul (1950). Functional anatomy of the vertebrates. New York: McGraw-Hill. p. 249.